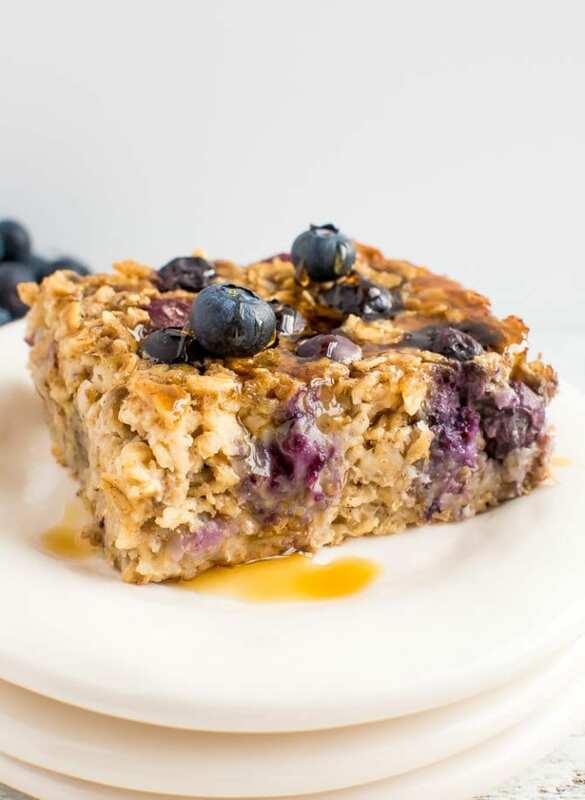 This blueberry baked oatmeal is studded with blueberries and naturally sweetened with bananas and pure maple syrup. 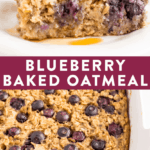 Can be made with fresh or frozen blueberries! Gluten-free and vegan-friendly. 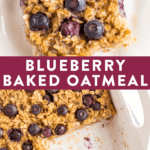 We kicked off Oatmeal Week with Baked Oatmeal Cups, which I love as a way to meal prep oatmeal, but today we’re doing a full-on baked oatmeal recipe that bakes in a square baking dish. 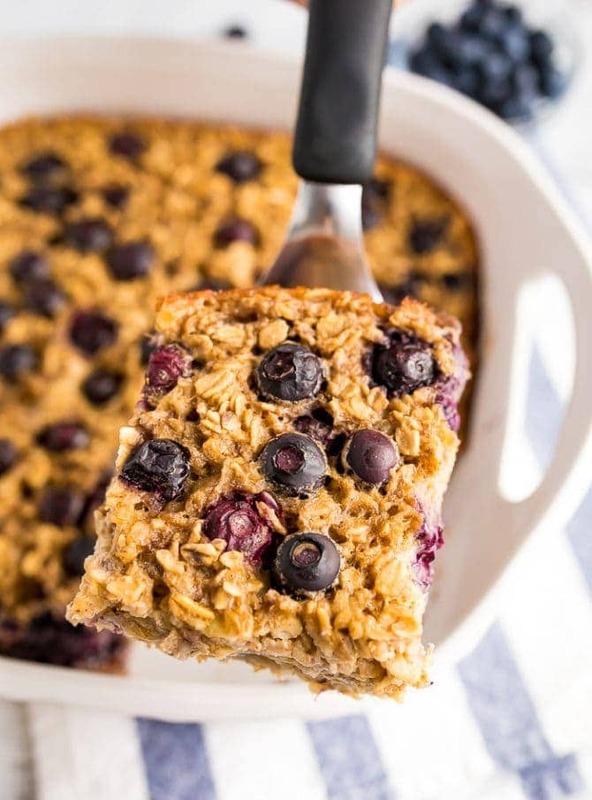 This variation of baked oatmeal is still uber healthy and perfect for meal prep, but it’s also great for entertaining. 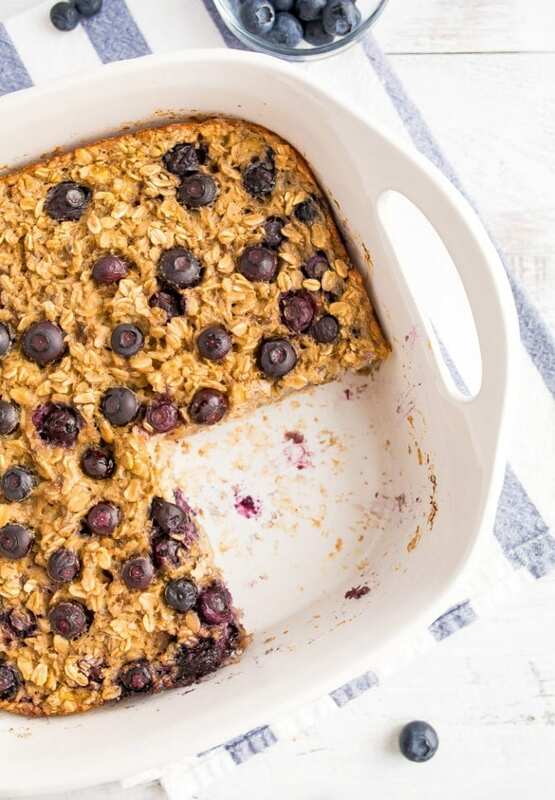 Whenever we’re having friends or family over for breakfast or brunch, baked oatmeal is on the menu. Sometimes I’ll also make a frittata so we have two options (one sweet and one savory) for everyone to enjoy. 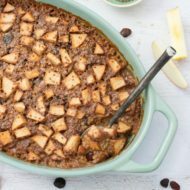 I’ve personally been hooked on baked oatmeal for a few years, ever since I shared this maple pecan baked oatmeal recipe that everyone LOVES. 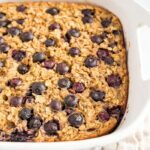 I recently decided that I needed to experiment with different baked oatmeal flavor combinations and blueberries immediately came to mind! I love blueberries because they’re available year-round (fresh or frozen) . . . and they taste delicious year round too! They’re also known for being a superfood and are “nutrient dense” (which means they are low in calories, but high in nutrients). A lot of bang for your caloric buck! They contain some of the highest antioxidant levels compared to most common fruits and veggies and they have been shown to help improve chronic diseases like heart disease, blood pressure and diabetes. So many amazing health benefits. 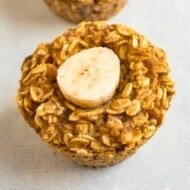 If you make your baked oatmeal ahead of time, store in an airtight container in the fridge for 4-6 days. If you prepped it for the week, you can separate out portions into smaller containers or baggies (I love Stasher Bags for this) so they’re ready for you to grab and go. I usually like to pop my portion into the toaster oven or microwave to heat it up right before diving in. 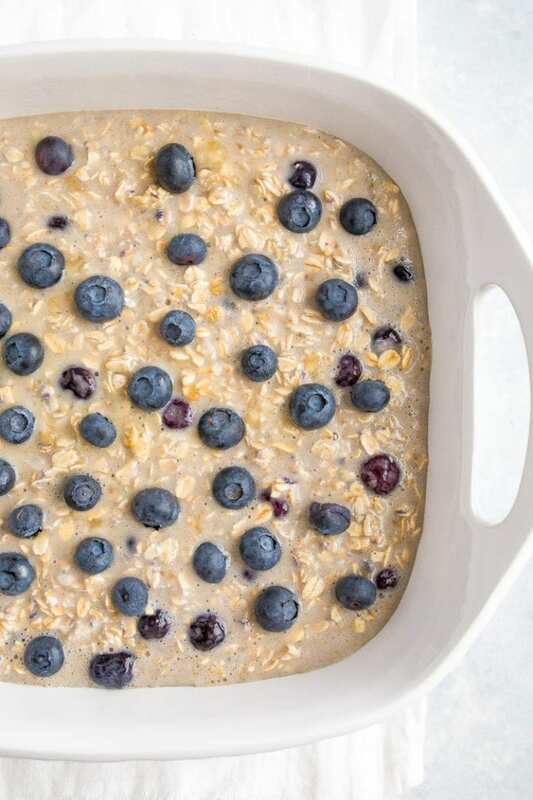 This baked oatmeal is good on it’s own, but to me, oatmeal isn’t complete without a drizzle of nut butter so I always serve my baked oatmeal with a drizzle of peanut butter or almond butter on top. So yummy! 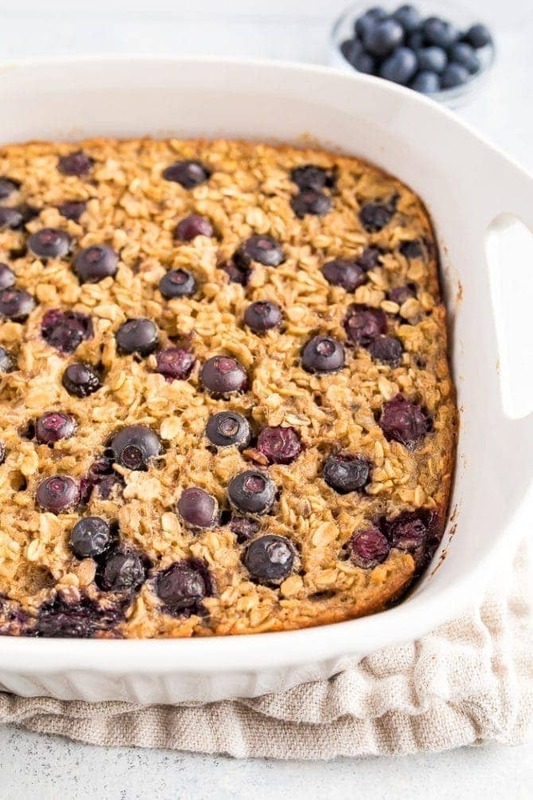 If you make this baked blueberry oatmeal please leave me a comment and star rating below. This feedback is super helpful for me and other EBF readers who are thinking about making the recipe. In a large bowl, mix together the oats, baking powder, cinnamon, and salt. Add in the milk, maple syrup, egg, coconut oil, vanilla and bananas. Stir well to combine. Gently fold in 1 cup of blueberries. Scatter the remaining blueberries across the top. Bake for 40 to 55 minutes or until the middle of the bake is set and the top is golden. Remove from the oven and let cool for a few minutes. Portion and serve. 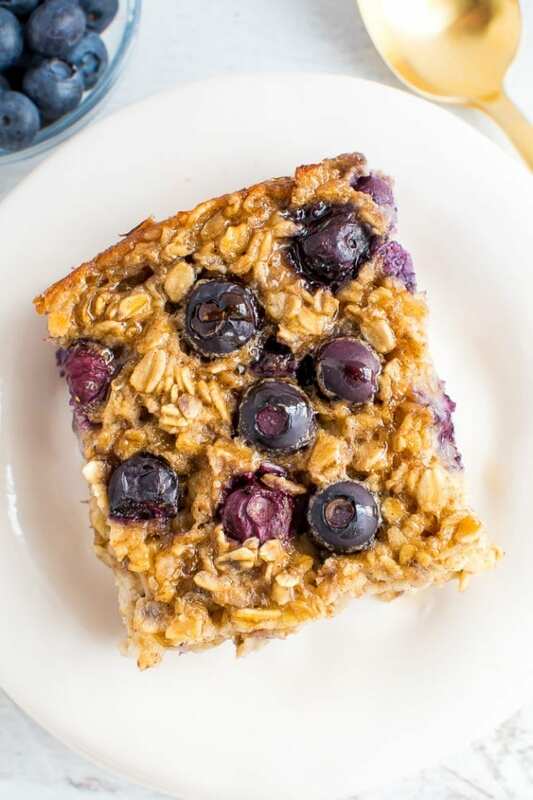 Top with additional fresh blueberries and nut butter, if using. Drizzle each portion with maple syrup if you want it a bit sweeter. Hi Brittany, I made it for dessert/evening snacking cake tonight – yum!! Mine was soft in the middle and I found the overall texture reminded me of bread pudding!!! 🙂 I topped it with maple syrup, of course. Next time, and there will be time VERY soon, I may add some nuts to the batter. I used frozen banana and blueberries, so perhaps that added extra moisture? Regardless, this is pure comfort food, why wait until breakfast?! I used frozen blueberries for this recipe and it never set. I even added more bake time. It still came out like a regular bowl of oatmeal. I’m mycase frozen blueberries is not a good substitute for fresh blueberries. The taste was amazing though! So good! My 5 year old loved it too. Hi Christina. Oh no! That’s so interesting because I used frozen blueberries in the bake and just add fresh on top. How long did you bake it? Did you make any other substitutions? My bake turned out to be a giant bowl of oatmeal. Still delicious though. Hi Mailee. It didn’t setup? Did you make any changes to the recipe? I sub the coconut oil for butter since I didn’t have any on hand. It was still delicious and my family devoured it! So good! Made it this morning! But just put all the ingredients in a sauce pan and cooked it on the stove! Topped it with a little peanut butter and milk. It didn’t even need any extra maple syrup! Bonus* my two year old daughter loved it and asked for more! Made this today and can’t wait for breakfast tomorrow morning!! Subbed 1 cup chopped Granny Smith apple for the blueberries and added 1/2 cup chopped walnuts and 1 scoop Native Whey Protein Powder, otherwise followed everything as is and it set perfectly in a glass 8×8 pan. Super tall, filled the pan to the top so the portions will be really large if I split this by 4’s as directed. Will have to see in the morning. I just made this on the weekend and it turned out delicious! I did have an issue with it setting (I used flaxseed instead of an egg) but found once I took it out and let it cool a bit it was fine. I took the leftovers for work and it was even better today! 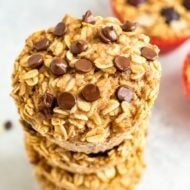 I made this last weekend for easy breakfasts throughout the week. I added a few tablespoons of peanut butter powder, and drizzled with honey instead of maple syrup (just not a maple syrup kinda gal). I also added some dark chocolate chips because let’s be honest, that’s just who I am. I made a batch and a half, which I baked in a glass 13*9 pan. Turned out perfectly! My husband, 6 yo son, and myself all enjoyed it immensely. Super moist and reheated well; I chose to consume mine cold and it was still a great breakfast. I’m going to make the recipe again this week using cherries & chocolate instead to change it up! Thanks so much for sharing — if I could give more stars, you’d have them. Please keep it up! Oh!! !i just did it for the 5 time! This time I did it with carrots. It is still delicious ? I made the recipe exactly as-is (except I forgot to add the coconut oil – oops!) and it turned out amazing!! I used a round Pyrex baking dish and put it in the oven for about 45 mins. Will 100% be adding this to the weekly meal-prep rotation – it would even be great hot for a brunch dish. Thanks for the great recipe! Thank you so much for the feedback, Kat. It’s so great to know that it still tasted delicious without the coconut oil. Perfect for those who are wanting to keep it oil-free! Enjoy! I made this last night for this morning’s breakfast…and probably for tonight’s dessert too, lol. It was so dang good! I followed the recipe as is & it’s very simple & easy to follow & make. I warmed it up in the microwave for about a minute & it was just as good as it came out of the oven. Will definitely be making this over & over. Thank you for creating this recipe! This became a fast favorite breakfast of mine. The nut butter on the top is an excellent addition too!